STEPPING into Unique Seafood Restaurant often reminds me of the many underwater world attractions I have visited on holiday, all thanks to their huge fish tanks that greet you upon entering any of its outlets. The “attraction” is a favourite among children who would make a quick dash to the tanks to gawk at the many fish, prawns and crabs. However, little do these young ones know that one of these fish would later end up on their dining table. 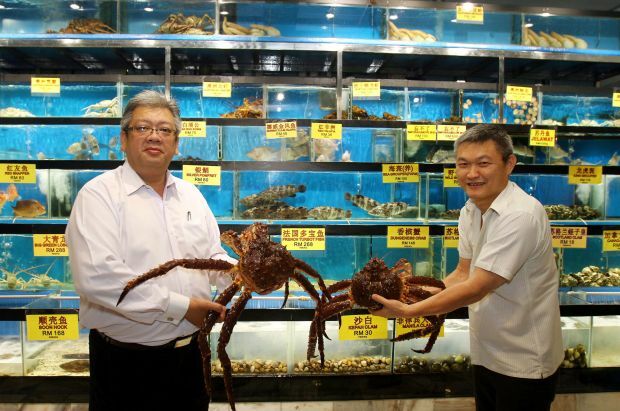 There is reason for this display, Unique Seafood managing director Wong Keong Fook said. “We want our customers to know that everything we serve is fresh and not from the freezer,” he said, adding that some customers would walk up to the aquariums to choose the seafood they want. The seafood business is nothing new to Wong, as he used to supply fresh seafood to hotels and restaurants prior to running Unique Seafood, which now has three branches, including one in Ipoh, Perak. “My customers sometimes ask me to teach them how to cook the seafood they bought from me. Simple and fresh: Barbecued fish served with three different sauces: pumpkin, sambal and a Thai inspired dip. “However, it is not easy to teach as seafood needs to be cooked to perfection to properly appreciate the freshness,” said Wong. Today, the group, which also runs Cheers Palace in Cheras, Kuala Lumpur, as well as Selayang Seafood Garden, Pantai Seafood and Ah Yat Abalone Forum Restaurant in Petaling Jaya, is expanding its business empire not only with more outlets but also in diversifying its menu. During a recent review with chief executive officer Benson Koh at their outlet in Citta Mall, Ara Damansara, we could hear the bubbles popping from the 35 fish tanks as we entered the fairly new outlet. Koh said, after 12 years in the industry, the outlet was their first in a shopping centre. The pork-free outlet serves similar dishes as other Unique Seafood restaurants and Koh assured that anything from silver pomfret and sea grouper to Scottish blue lobster and Alaskan spider crab was available. An avid chef and food lover, Koh made sure we were in for a range of seafood as he felt we should try everything before settling for what we liked best. We started off with the Indonesian mud crab, which was prepared in two styles ? one baked in honey while the other was cooked with bird’s eye chilli. “If you think the cili padi version is a little spicy, you can always opt for the other but we know how much Malaysians love their spicy food which is why we decided to introduce it here,” he said. He added that the sauce for the dish contained ginger, onion, calamansi, chilli, garlic, shallot and lemongrass. 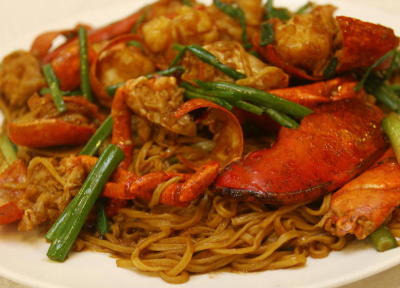 The next dish was the flavourful Braised Noodle with Boston Lobster, followed by Barbecue Silver Pomfret. The fish, he said, was nothing new but this was the first time they had decided to barbecue it without soaking it in any sauce. It is prepared in the simplest possible way, just a little salt before it is grilled. “This way, diners get to taste the original sweetness of the fish fresh from the water,” he said, while inviting us to try the three sauces: pumpkin, sambal and a Thai-inspired dip placed around the plate. Next was the Steamed Scotland Scallops with Glass Noodles topped with Garlic and the Mixed Chilli Fried Chicken. “We are always trying out something new; sometimes we do not need to follow the usual style of steaming or frying but grilling and even eating it sashimi-style can bring out the best flavours of a seafood,” said Koh. The outlet also has seven rooms with some equipped with karaoke facilities for those who want to have their meetings or private family dinners.